As we pile off the helicopter, our tour guides -- Peruvian oil executives in jungle gear -- hand out cans of bug repellant. The rotors stop and a thick wet blanket of jungle air envelops us. The rain forest canopy has been cleared from an area the size of a football field to accommodate a drilling rig, leaving no place to hide from the Amazonian sun. The din of insects is drowned out by the hum, clank and whirr of drilling machinery. Gallinazos (turkey buzzards) circle above the rig. Our fellow visitors, a gaggle of camera-toting U.S. Treasury Department inspectors from Washington, D.C., had landed in Lima late the night before. 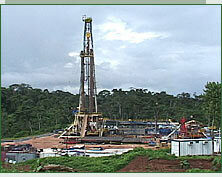 They've come to verify that the project is complying with standards required by multinational development banks. Their reports will help determine whether the U.S. government will vote to approve the loan needed to complete the Camisea gas project. Bug spray deployed, we begin the company tour. The subject of our tour, the San Martin 1 wellhead, sits deep in the Camisea, which the consortium calls Block 88, and is the nearest to completion of four wells that will soon tap into the gas field a mile below the surface. High on the drilling rig, workers are preparing to drop explosive charges down the well. The charges shoot molten "bullets" through the steel pipe and open holes that enable the gas to flow into the pipe and up. On a hill just beyond the rig are a clutch of dozens of air-conditioned trailers and tents in which about 200 workers live, some of them for 45 days at a time. There are no roads connecting this isolated site to the outside world, and workers spend their nights playing foosball or watching news of the Iraq war on satellite television. Virtually everything in sight was flown in by helicopter-- this is, we're told, to prevent loggers and settlers from using company roads to deforest the area. Bringing in the drilling rig alone took more than 300 helicopter flights. Company helicopters buzz through the air constantly like prehistoric dragonflies. Recent rains -- which can drop as much as an inch an hour here -- have turned the site's red dirt into puddles of thick muck. We're all quickly covered in the stuff. Twenty indigenous workers wearing company jumpsuits are scattered around the site, trying, with little effect, to scrape up the mud. San Martin 1 is the first of four rigs, or "well pads," in the Camisea region that will eventually tap into the Camisea region's gas. From the rig, the gas will flow to the oil consortium's base camp at Malvinas, where a processing plant will separate the natural gas from gas liquids, such as propane and butane. Two pipelines, buried side by side, will then transport the natural gas and the gas liquids to Lima and the Peruvian coast. As we walk, company guides explain to us that the Camisea project is different from the destructive crude oil drilling projects of the past that destroyed pristine rain forests in other parts of the world. Using a combination of advanced technology, rigorous monitoring and community relations specialists, "you can't have zero impact, but you can minimize it to an acceptable level," Gary Pidcock, the drilling superintendent, assures us. Because this is natural gas they're drilling for, and not crude oil, company representatives insist that the environmental dangers are few. "When natural gas spills, it just blows away," one company representative says to the U.S. inspectors. Pidcock describes elaborate measures taken by the companies in the name of environmental protection. To minimize the number of wells needed, cutting-edge directional drills extend out and down more than 3,500 meters in four directions from each well. A zero discharge system is used to clean the "mud" -- a drilling term for chemical-laden dirt and water pulled up during the drilling process. Only cleaned water is discharged back into the rivers, and it is sampled once a week by an independent monitor, Pidcock says. Human waste also is cleaned -- by a "Blue Dolphin," a box the size of a Volkswagen bus located behind the living quarters. On one end, tubes of sewage enter the humming blue box. On the far end, a burbling fountain of odorless, clear water seems to invite guests to fill up their water bottles. A sign greets visitors stepping off the plane and into the Malvinas base camp. Malvinas is 58 kilometers (36 miles) east of the San Martin 1 wellhead. 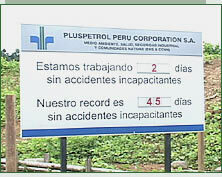 The sign reads: "We have been working two days without incapacitating accidents. Our record is 45 days without incapacitating accidents." The Machiguenga workers are part of this low-impact approach to development. We're told that hundreds of Indians have been recruited for manual labor jobs on the project as a way to stimulate local development. Company representatives say that the changes have been welcomed by most Indians. "Part of the responsibility of the company is to integrate them into the project, the project into them, and to help those communities that we're living with. That's the philosophy," TGP general manager Alejandro Segret had told us when we'd spoken to him days earlier in his office in Lima. "You [can't] be romantic and let them live the way they've always lived," Hunt Oil's del Solar had said, in a blunter assessment. "You have to weigh the benefit to [Peru] versus letting these communities stay the way they are." Once the company tour is over, we're eager to hear what the Machiguenga themselves -- who live in various communities scattered across the region -- feel about this vast project. But we're not going to get very far by just interviewing workers here, in the presence of company officials. So we backtrack to Lima and return to the Camisea, this time traveling the way the Machiguenga do.